In terms of size, you'd be hard-pressed to find two exotic pets at such opposite ends of the spectrum as the hermit crab and sulcata tortoise. If you purchase a sulcata tortoise at a pet store, it might be quite small. However, at maturity this animal weighs between 150 and 200 pounds and requires special accommodations. 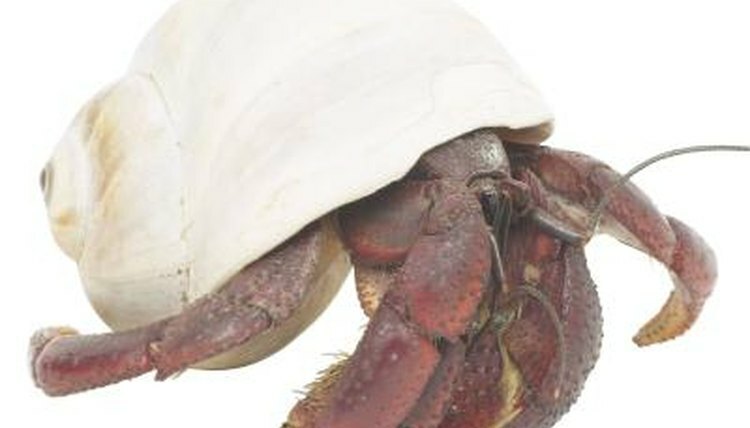 Hermit crabs should only live with other hermit crabs, so they shouldn't be placed with even small tortoises. You can keep your hermit crabs in a large, glass aquarium. Provide your pets with a substrate consisting of sand sold for children's sandboxes mixed with coco fiber. The latter material is available in pet stores. Because hermit crabs constantly outgrow their borrowed shells, keep several sizes available in the cage. It's always best to keep more than one hermit crab, as they are quite social. Sulcata tortoises, also known as the African spurred tortoise, are among the largest tortoise species in the world with a lifespan of 100 years or more. They require a grassy, fenced area with constant access to fresh water. If you live in a cold climate, you must provide your tortoise with a large, heated indoor home when temperatures drop.